The silvery aluminum facade of the 10-story office building was a jewel of a corporate showcase for Pepsi-Cola, but its simple, restrained and fine modernity fizzled after a few years when the soft-drink concern and conglomerate moved its headquarters to a very handsome new corporate campus in Westchester County, a major and historically important defection from the city to the suburbs. The building has always been highly praised, indeed, overpraised, for it is not great architecture, only an very attractive, fine small office building that was even more incongruous when juxtaposed with its masonry neighbors when it was built. Its jewel-box quality created by large windows, thin mullions and superb detailing is undeniable, of course, and it was following the lead on the avenue of Lever House (see The City Review article) and the Seagram Building (see The City Review article), so its clean-cut lines and svelte proportions were well-intentioned in an age that rarely mentioned the bugaboo of "context." Another reason that the building has been widely lauded was probably that its second owner, the Olivetti Corporation, was held in the highest esteem for its espousal of elegant design. The 40-story luxury apartment tower addition is an excellent example of contextual architecture, using the aluminum and glass facade of the low-rise building as a major component of its design and setting its tower as far back from the avenue as possible. The tower is partially covered with a much darker facade with deeply indented windows that create a bold and handsome contrast. This 1984 condominium apartment tower is one of the finest post-war designs in the city and the winner of a national award for its architect, James Stewart Polshek, from the American Institute of Architects. 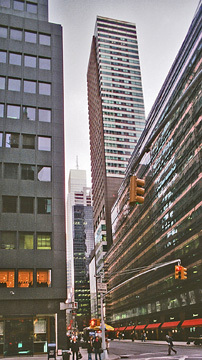 Its clean-cut, modern lines, incised windows and asymmetrical massing have been highly influential and the building is a rare example of a contextual design that complements a modern landmark, the short office building it is an extension of at 500 Park Avenue on the southeast corner at 59th Street. The small, elegant, aluminum-and-glass building was designed by Skidmore, Owings & Merrill as the headquarters in 1960 for Pepsico that subsequently became known as the Olivetti Building and then the Amro Bank Building. The 16 lower floors of the 40-story tower contain office space, an advantage to the residents in this multi-use building as it removes them further from the street's heavy traffic. The architectural firm of Schuman, Lichtenstein, Claman & Efron also worked on the design for Charles and Randall Atkins, who had offices in the small office building and eventually sold their interest in the planned tower to Tishman Speyer Properties and the Equitable Life Assurance Society of the United States. In an August 16, 1984 column in The New York Times, Paul Goldberger observed that "The brooding, dark-gay granite of the office floors at the base is handsome in a cold and official sort of way, but this strongly undomestic imagery is the building's only major failing." "And," he continued, "perhaps it is justified by the larger purpose it serves - for the granite, used in tandem with a glass and aluminum skin, creates a dignified backdrop to Skidmore's delicate modern box. At the same time, the glass and aluminum sections of the new tower act as a counterpoint to the older structure, making the overall design a subtle balancing act of foreground and background, of solid and void, of texture and flatness. Indeed, this is among midtown's best new towers, residential or commercial. And the apartments within are generally excellent, with nine-foot, two-inch ceilings, handsome windowed kitchens complete with Sub-Zero refrigerators and windowed baths. With its sprawling entrance gallery, an expansive A unit high in the tower could almost be a 1920's apartment sleekly renovated - until you see the wraparound windows of the living room." The subtlety of Polshek's design is in his brilliant massing and façade treatment and overall proportions. The tower's façade has a distinctly split personality with a silvery aluminum bay that runs up its east side to complement the low-rise office building and the strongly delineated "matte" façade with incised windows on the other facades. The building, which is a masterpiece, has a stunning lobby. Polshek maintained in "James Stewart Polshek Context and Responsibility," (Rizzoli International Publications, 1988), that the "tower was conceived as a singular piece of architecture in its own right but also as a building that would be a backdrop for the elegant integrity of the existing building. The tower also had the urban design function of clearly indicating the east-west boundary between commercial Park Avenue to the south and residential Park Avenue to the north. The parti involved the creating of a granite shaft perforated by deeply set windows. From this stone tower unfolded an aluminum and glass envelope whose twenty-four stories of residences cantilevered twenty-five feet over the existing building. The new metal skin was derived from the existing building, but energy laws and technical constraints regarding the sizes of glass and available aluminum alloys required a reinterpretation of the original envelop, the objective being to retain the proportional subtleties and flush surface characteristics that had always distinguished the building. In their book, "New York 2000, Architecture and Urbanism Between The Bicentennial And The Millennium," Robert A. M. Stern, David Fishman and Jacob Tilove said that "Polshek's building could be seen as one of the city's architectural success stories of the 1980s, involving historic preservation - of a Modernist building ten years too young for designation by the Landmarks Preservation Commission - and new construction of a mixed-use skyscraper of exceptional suavity." "Described rather improbably by Ada Louise Huxtable as a 'kind of Pazzi Chapel of corporate design,' Pepsi-Cola was designed by Gordon Bunshaft," the authors continued, adding that "When it was completed, Pepsi joined Lever House lower down on Park Avenue, Manufacturers Trust Company on Fifth Avenue and Forty-third Street, the Chase Bank in the financial district - all designed by Bunshaft for Skidmore, Owings & Merrill - and Mies van der Rohe's Seagram Building to form the greatest concentration in one city of artistically exceptional commercial Modernism." When Olivetti decided to leave the building, studies were made to redevelop the site along with the adjacent Nassau Hotel at 56-60 East 59th Street that was built in 1897 as the Hotel Roland and designed by F. W. Fisher. The Kalikow real estate organization acquired the combined site but soon resold it to the Securities Groups, which was headed by Charles and Randall Atkins. Securities Group commissioned Polshek to design new offices for it on the 10th and 11th floors of the Pepsi building and then Polshek was commissioned by the Amsterdam Rotterdam Bank (AMRO) to redesign the retail spaces in the building. The Atkinses then commissioned Polshek to design the adjacent tower that would cantilever 25 feet over the rear of the Pepsi building. "If a specific source for the design were to be identified, it would be that of the PSFC Building (1932) in Philadelphia, designed by George Howe and William Lescaze," noted Stern, Mellins and Fishman, who added that "approval of the plan was held up by the City Planning Commission's study of midtown zoning, and by 1981, when the Atkinses found themselves in deep financial trouble, the Securities Groups sold the property to the Equitable Life Assurance Society, which entered into a joint partnership with Tishman Speyer Properties to develop the project according to Polshek's plans." "When Ada Louise Huxtable reviewed models and drawings for the scheme in May 1981, she called it 'one of the most skillful 'shoehorning' jobs, involving an unusual and uncommon, sensibility to considerations of style and scale," the authors continued. The main entrance to the apartment tower is midblock on 59th Street, which is quite narrow and usually full of traffic. The enlarged project, however, is a far more interesting and better one than the original building and the residential tower is one of the best looking in the city. Its midblock location, furthermore, results in unusual views, especially as the tower of the Delmonico Hotel on the north side of the street is built closer to the avenue. The understatement and subtlety of the combined development results in a powerful assemblage of great grace, a rarity in a city known for chaos, bravura and an aversion, in the waning years of the millennium, to modernity and quality design.